The mid-range smartphone segment has become my favourite in 2018. We have seen a lot of features we saw on flagship phones a year ago being brought to this segment and frankly it is amazing. Some of these features include 4GB of RAM, 64GB of internal storage and face-unlock and this mid-range phone has all of that. The Oppo A7 surprised me when I got it over a week ago and I’ve been using it as my daily driver since. Before we start, let’s go over the specs one more time so as to be on the same page. The screen is a gorgeous 720p display, my favourite 720p display so far. It has a teardrop notch at the top which surrounds the 16MP selfie camera that we saw with the Oppo F7 first then the OnePlus 6T later on and frankly, this is the best notch out there. The volume buttons are on the left and the power button is on the right and this took some adjusting to do since I was used to a phone that had all of these buttons on the right side. It has a headphone jack (THANKFULLY), microB USB connector and speaker at the bottom and nothing at the top. The rear is where you get to see the dual primary cameras with a weird gold ring around it that also covers the flash. The oval fingerprint scanner that we’ve been used to on Oppo is also here that is surrounded by a thin gold accent. These systems work beautifully on the Oppo A7. They work as advertised. If you set up both face unlock and fingerprint unlock, you will end up using the face unlock as your primary unlocking mechanism and when it fails at night, you can use your fingerprint scanner. The face unlock is fast and reliable in good light, as it should be. In low light conditions, it will brighten up the display to lit up your face to identify you. The fingerprint scanner is incredibly fast. Oppo has put a high quality fingerprint scanner on this phone at this price bracket and I’m not complaining at all. On a typical workday, I usually ended up having 40% by evening which is amazing. This is an easy two day phone for anyone and I’m glad they added this huge battery. The Oppo A7 sports an octacore Snapdragon 450 processor and a healthy 4GB of RAM. The processor is to be expected in this price range, but we are now in an era where we get phones such as this with 4GB of RAM. The phone rarely hangs and I blame that to the healthy dose of RAM. Android is a RAM hog and it requires a lot of RAM to run well and it seems 4GB is now the new baseline. I can open multiple apps with ease and never think about closing them to save on RAM and frankly that is great to have. I have no complaints in this area. The Oppo A7 has 3 cameras in total: A 16MP selfie camera and a 13MP/2MP combo at the back. One thing I’ve come to like with Oppo smartphone cameras is their processing. Their colors are accurate and they don’t exhibit oversharpening like I see from other smartphone manufacturers. The cameras are not ‘spectacular’ as we are already spoilt with great cameras from phones 4 times its price, but they are good enough. The camera launches fast, which is a major PLUS and the x2 zoom works well, although I suspect it is a digital zoom of sorts. It is prone to overexposing photos and you have to dial down the exposure everytime when you take a photo. The dynamic range is also not good either, but it was expected. Both primary and selfie cameras shoot upto 1080p video which is adequate for the occasional sharing on social media. Another great thing about this phone is the included smartphone case. I’m sure this is not something you are used to in a smartphone review but this phone has a really good smartphone case. The best thing about this case is how it shields that display well. The case has a raised lip all around the screen and this is great to see on a case. When your phone falls down, your screen would be shielded by this raised lip and this should be in every first party case. Color OS is the skin that Oppo uses on top of Android and I’m not its biggest fan. The phone runs Android 8.1 Oreo, which is good, but it is customized heavily thanks to Color OS running on top of it. Color OS looks like iOS and this is shown beautifully on the settings app. If you’ve ever used an iPhone, you’d notice how incredibly similar it is to the iOS settings app. 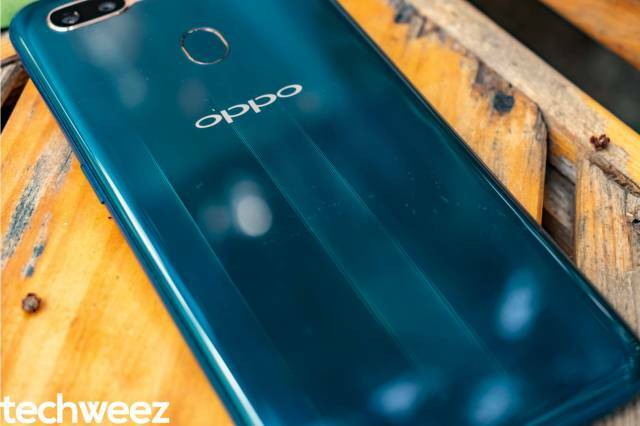 Details such as the OPPO ID section at the top that reminds you of Apple ID, the arrangement of the various settings and also how far they have hidden the SIM toolkit, which is crucial for MPESA services. Color OS also doesn’t have an app drawer so if you are used to app drawers, forget it. You are forced to put apps on the homescreen. A neat way is to arrange things in folders and dragging and dropping files into this phone is very fiddly. I wish there was an option to add apps to the folder via an ‘add apps’ icon like the one Sony has on their UI. Tucked away under settings is another Color OS trick. Navigation options. The default navigation icons on Android has always been the back, home and options buttons but with Pie, that was changed. This phone runs Oreo but Oppo gives you a way to use a variety of gestures to navigate through the user interface. They feel very iOS like and they are not feel ‘natural’. I have used the gestures on the iPhone X and it didn’t feel like it was fighting me, but in Oppo’s case, these gestures were too fiddly, you needed to do multiple takes to get a gesture right. I’d advise you to stick with the traditional Android virtual buttons. I had a very interesting experience with the Oppo A7 regarding connectivity. I use my Telkom 4G SIM card primarily for data and for some reason, it didn’t switch to 4G at any point during my testing. My Huawei in comparison was on 4G all the time when I switched back to it. Telkom uses the LTE Band 20 and the phone supports it, so I’m still not sure what was happened. This phone has a huge battery and since it doesn’t have quick charge, it takes a long time to charge it. It may not be an immediate problem since it has such excellent battery life and you’ll only need to top it during the night, but when you need a quick top up in the morning before heading out, it will recharge slower than others. It also feels particularly warmer than usual when charging so don’t charge it under the pillow, like we have seen some people do from the news. I really really like this phone. From the moment I put my SIM card in and started using it, I knew Oppo had a winner here. The 24-25K market has now become my favourite smartphone price segment and you can find really good phones for the price. The Oppo A7 has killer battery life, great 720p screen, rock solid performance and the camera launches fast. I have few complaints about it.